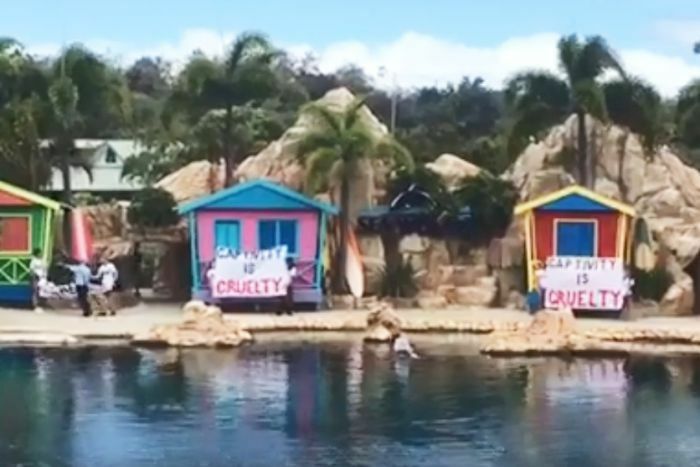 Management at the Sea World Marine Park on the Gold Coast has been forced to call a halt to three live performance shows after coordinated disruptions from animal rights protesters. Activists from Justice for Captives disrupted a seal performance and two dolphin shows on Saturday morning. Videos posted to the protest group’s Facebook page show activists holding signs toward crowds reading “animals are not entertainment”, “captivity is cruel” and “dolphins belong in the ocean”. 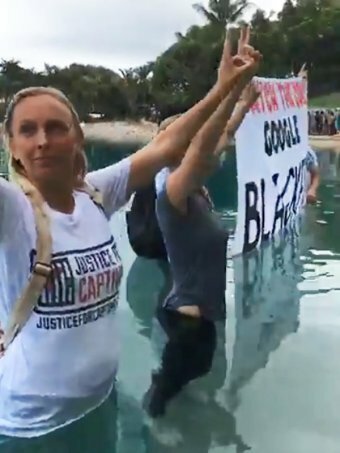 In one video, members of the protest group enter the water and caused the second dolphin show to be cancelled. “We were identified as potentially causing a scene and four of us made it in … the others have been escorted out,” one protester said. “We are going to hold our ground until we are physically removed. The video ends with the crowd applauding as police officers arrived to remove the activists from the water. Footage of all three disruptions shows unhappy crowds, with audience members jeering, throwing food and attempting to take the signs from the activists. In a statement, Sea World said the shows were ended early after safety concerns. “We welcome constructive and professional dialogue with activist groups in a respectful manner, and find the tactics of this group unprofessional and dangerous not only to themselves but to the animals and guests,” the statement said. “We are currently working with the authorities to take the appropriate actions. “Sea World is very proud of its world-class exhibits for dolphins and seals. “It is pleasing to have the support of our guests, who cheered when the group was escorted out of the presentations.